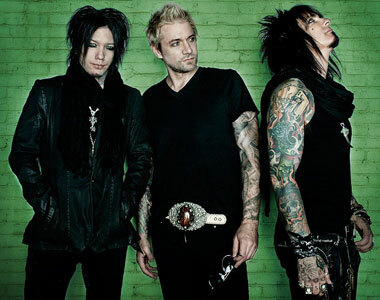 Sixx:A.M. Biography, Discography, Music News on 100 XR - The Net's #1 Rock Station!!! 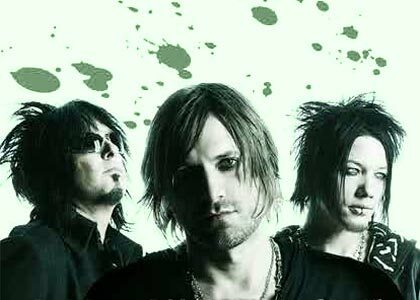 Sixx:A.M. is the Hard-Rock project formed in 2007 by Mötley Crüe bassist Nikki Sixx, guitarist DJ Ashba and singer + producer James Michael. Nikki Sixx was born Frank Feranno in San Jose, California USA, on December 11, 1958 and grew up in Seattle with his grandmother. At the age of seventeen, he sold his guitars and took a bus to Los Angeles, where he began hanging out in local clubs and playing in bands. 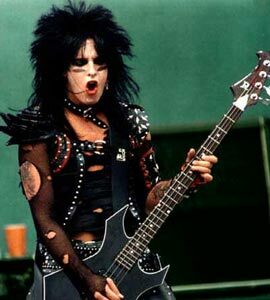 He founded Mötley Crüe in 1981 with friend Tommy Lee. Few bands were as influential as Mötley Crüe in making the '80s the heavy-Rock decade. Theirs is a cyclonic story of runaway success and its price, blending outrageous record sales and arena headline tours with smashed up cars, jail sentences, models, drugs, breakups, reunions and more breakups. "The Heroin Diaries", is a book drawn from Sixx's 1986 and 1987 journals, when he was in the throes of a heroin addiction. In September 2007, "The Heroin Diaries Soundtrack" was released via Eleven Seven Music in conjunction with the book. "Life Is Beautiful", the first single from the CD, easily climbed The Hot Mainstream Rock chart falling just one position short of #1, peaked at #25 on The Hot Modern Rock Tracks and also made waves in other countries like Canada, U.K. and Australia. The album eventually enjoyed a 108-week chart run in The Billboard 200, reaching the #62 position and spawning two more Hot Mainstream Rock top 40 hits, "Pray For Me" and "Tomorrow", as well as a minor hit single: "Accidents Can Happen". Nikki Sixx issued "This Is Gonna Hurt: Music, Photography And Life Through The Distorted Lens Of Nikki Sixx", the follow-up to his New York Times bestseller "The Heroin Diaries", in April 2011. The book, part photo chronicle and part journal, was accompanied by the release of an original soundtrack from Sixx:A.M., an 11-track companion piece to the book, which arrived in stores that May. "This Is Gonna Hurt", highlighted by the Active Rock #1 smash "Lies Of The Beautiful People", quickly catapulted into the top 10 of The Billboard 200 Albums chart. The second single, the disc's title-cut, was also a top 10 hit at Mainstream Rock radio and "Are You With Me Now" nearly cracked the top 30 of the same chart. October 2014 saw the trio release "Modern Vintage", a mixture of different songs offering different moods. The first single, "Gotta Get It Right", quickly ascended into the top 20 of The Mainstream Rock list.